Croatia does Aperol Spritzes too! This one was imbibed during our “Beach” day in Split – also known as the day that A Brummie Home and Abroad got cross with the little shits throwing sand. Nothing calms down a cross Brummie more than an Aperol Spritz. Is this the highest Aperol Spritz I’ve had? We got the cable car up Mount Srd in Dubrovnik and couldn’t resist a drink with a view! And onto Germany – we found our hotel in Augsburg, quickly freshened up and went in search of the town square! And despite being the end of March, we enjoyed the spring sunshine sitting at one of the al fresco bars, watching the hustle and bustle. With an Aperol Spritz. Of course. Mr Fletche was designated driver in Germany, so he was on the coffee whilst I snuck in this early afternoon Aperol Spritz at Landsberg am Lech. By early afternoon, I mean 12 o’clock. Or 11:45. Or 11:30. Ish. This blog is not sponsored by Aperol Spritz in any way. But if they wanted to send me a bottle for every mention of “Aperol Spritz” in this blog, then that would be 13 bottles. One per month for a year (and an extra one for good luck). Do you have a favourite “holiday drink”? Croatia 2016: A day in Montenegro! "An Alternative London To-Do List…"
"An Alternative Weekend in London"
Brilliant Idea!!!!! I am not really a drinker, but like a Rose Spritzer! That was my tipple of choice last night! As I was driving! One was just enough! 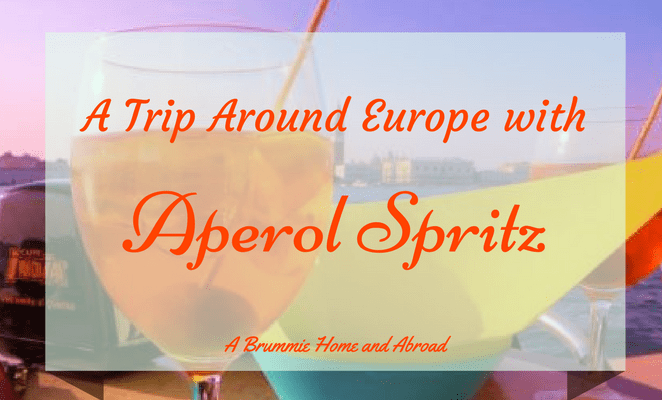 I’ve never tried an Aperol Spritz before, but now I really want to! Why have I never heard of this drink?! It sounds lovely! What a cool idea. I wish I’d thought of doing that with all the holidays I am going on at them moment. What drink would I choose though? Emmm wine and more wine. I need to think about this – amazing idea!